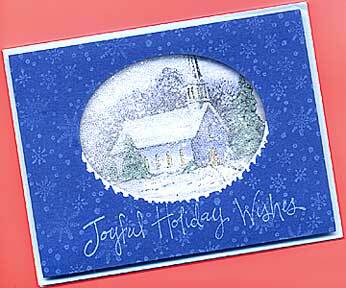 Here are some handmade Christmas Cards from friends around the world. I just love to receive homemade cards in my mail box. Every card is special and unique and carries with it a bit of the person who created and sent it. And especially around Christmas season, when it's a time when most people would just purchased cards from the stores to send to families, friends, colleagues, and business associates. It's not that I'm against store-bought cards. It's just that a handmade cards created with such care and love is so precious. Knowing the time the sender put into that card at a busy time of the year makes the card a gift to be treasured forever. So take a look at what my friends sent me and I pray that a portion of the love ingrained in these cards will touch you in some way. A green, red and golden Christmas' greeting from Candy Gray. Notice the red glitters in the berries and also the gold glitters in the star. 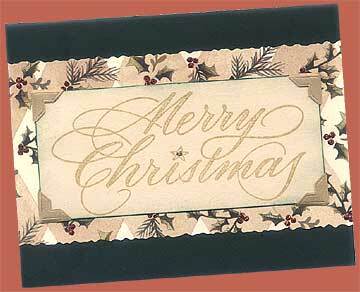 "Merry Christmas" is handstamped with gold ink onto a light brownish card which is edged with a shade of green. Then this is mounted onto the patterned paper with photo corner tabs. And then layered onto a dark green blank card. Inside the card, Candy handstamped the message, "Jesus is the greatest gift of all" in gold ink. She also signed her card on the back of the card with a dove rubber stamped in gold. What a card! And what a sweet blessing! Thank you, Candy for thinking of me this Christmas. A bit different from my other handmade Christmas cards from friends. A shaker card! Yes, Judy DiSicipio made this snowy shaker card for me this Christmas. See the snow dripping from the lower edge of the oval cutout. Inside the compartment, Judy placed lots of clear micro beads. So when you shake the card, the beads rub against each other and make a sound. She also add glitters on the roof of the cottage, the trees and also on the snow on the ground. The rubber stamped message inside this handmade Christmas card reads, "May a peaceful spirit fill your heart and bless your life this season and all year long." Thank you, Candy, for this lovely handmade Christmas card. May the wonderful Lord of the Christmas season fills and surround you with His love and blessings. More handmade Christmas cards from friends will be added here by and by so keep checking back often.